Extra Heavy Duty Work Platforms Provide Elevated Access To Overhead Work Applications. Extra Heavy Duty Work Platforms are constructed of rear vertical and base frames made of 2 x 1 rectangular steel tubing with powder coat finish for added strength and long lasting durability. Helps increase productivity by allowing access to overhead maintenance jobs, stock picking, construction and repairs. 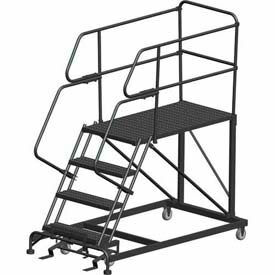 Stairway Slope Work Platform models offer a more gradual slope equates to optimal ascending and descending. 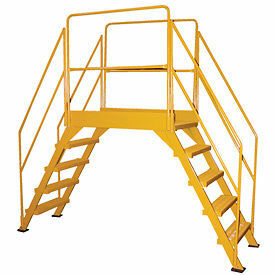 Work Platforms provide easy to use heavy duty pedal activated locksteps with 4" casters for mobility. Self-cleaning slip resistant serrated grating for added safety. Packaged in patented Ladders in a Box, helping to reduce chance of material damage. Meets OSHA and ANSI requirements. Available in a variety of sizes. Capacity is 800 lbs. Color finish is Gray. Number of steps are 3 to 7. Additional Exit Options Available Upon Request. Heavy Duty Double Entry Mobile Platforms Are Used For Warehouses, Factories And More. Mobile Platforms are made of tubular steel with gray powder coat finish for long lasting durability. Slip resistant serrated grating and 36 inch handrails provide extra stability. Heavy duty pedal activated lockstep with 4 inch casters provides ease of use. 800 lb. capacity. Step quantities are 3, 4, 5, 6, 7. Dimensions vary per model. Meets OSHA/ANSI requirements. These Ladders Can Be Mounted Where Permanent Access At Crossover Points Are Needed. Upper platform features removable two-sided 42 H handrails with 21 mid-rail and 4 H toeboards for safety. 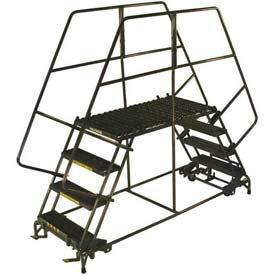 Cross-over ladders are made of all welded steel with 500 lb. capacity. Serrated steps offer extra grip and safety. Steps are 24 W x 7 D with a step height of 10 . Overall ladder width is 29 . Ground legs include rubber feet for stability. Meets OSHA and ANSI A14.7 standards.